2015 – “Blue White Night” – A meditation on skips and cycles. 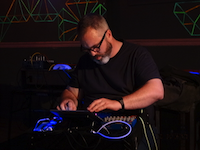 2014 – “A Music Made Of Noise” – Live set at the National Electronics Museum as part of the 2014 NEM Electronica Fest. 2013 – “Fish Are Jumpin'” – Live set at Club K, Baltimore, June 2013.